Lt. Gen. Kenneth McKenzie is the new commander of Marine Forces under US Central Command, also known as MARCENT. A front row of dignitaries including US Central Command Commander Army Gen. Lloyd Austin III and Marine Corps Commandant Gen. James Amos. 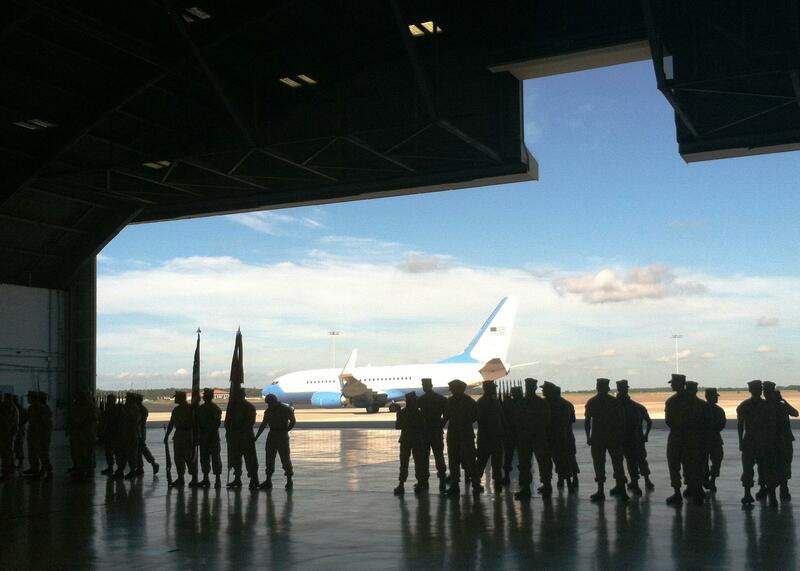 The aircraft that carried top military leaders to the change of command ceremony is framed by silhouettes of Marines waiting for the ceremony to begin. 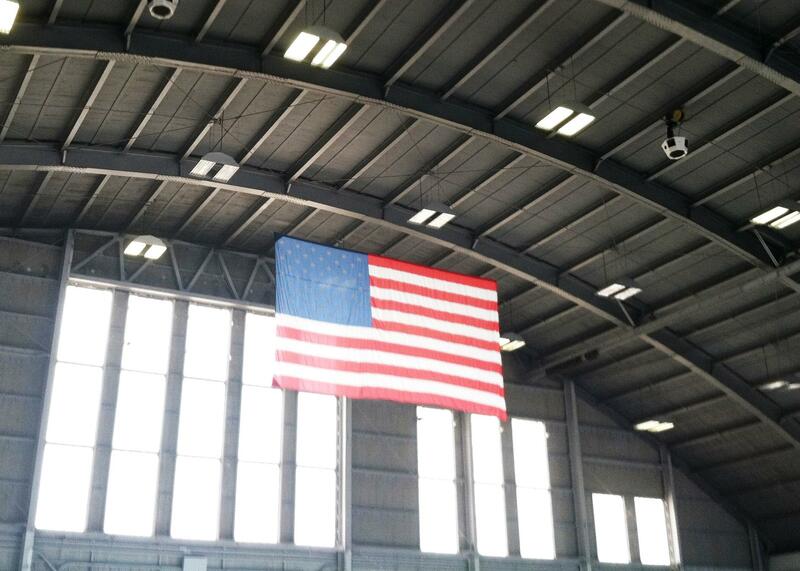 The American Flag in Hangar One at MacDill Air Force Base where the change of ceremony for MARCENT was held. 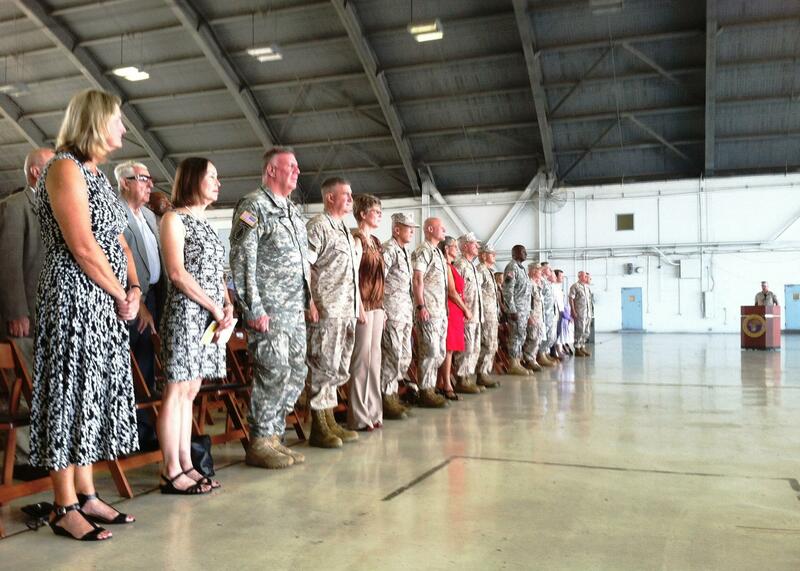 Top U.S. military leaders responsible for Afghanistan and Iraq were in Tampa today for a change of command ceremony. Lieutenant General Kenneth McKenzie took over as commander of the Marines Forces U.S. Central Command (MARCENT), which means he now is responsible for all the Marines serving in the Middle East and Central Asia. Presiding over the ceremony, held inside Hangar One at MacDill Air Force Base, was Marine Corps Commandant General James Amos, who praised the success of the recent elections in Afghanistan. "We’ve got every reason to feel good about what’s been accomplished in that country, and it was the same way in Iraq," Amos told the audience of more than 300, mostly military personnel. "Iraq is going to play out however it’s going to play out. But we as nations, we as the coalition and the joint forces, sanctified the ground. We sanctified the ground in Iraq." Amos said in his opinion that the joint forces also have sanctified the ground in Afghanistan. Both Gen. Amos and new CENTCOM Marine Commander Lt. Gen. McKenzie declined to give specifics about Iraq and the recent surge of fighting by Islamic militants. 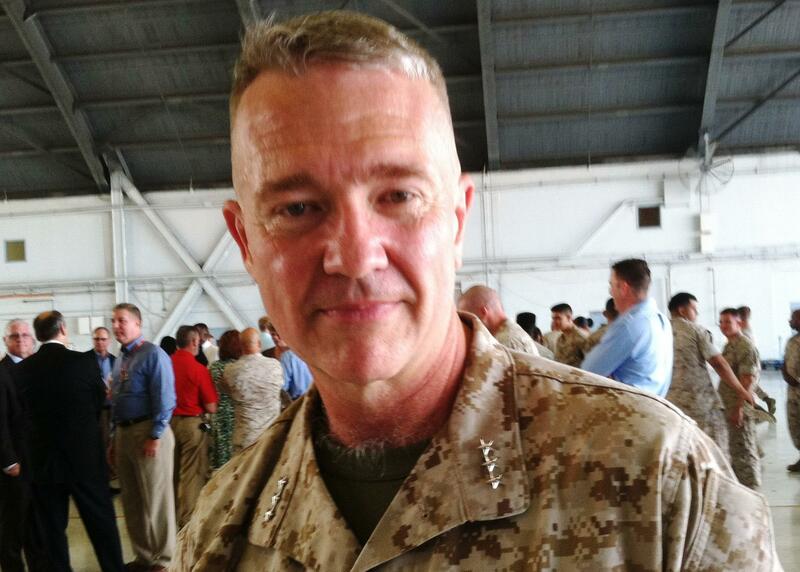 But McKenzie, who is now responsible for about 6,000 Marines serving in the CENTCOM "Area of Responsibility," offered a perspective through the lens of the Afghan elections. "What you see in Afghanistan is you’re seeing the Afghan National Security Force actually being able to stand up to the Taliban. A lot of people a year ago didn’t think it was going to happen," McKenzie said. "There may be some lessons there that we can apply in Iraq. Don’t know. Two different countries, two vastly different problem sets." As commander of MARCENT, McKenzie will work for CENTCOM Commander Army Gen. Lloyd Austin III. It's similar to 10 years ago, when McKenzie led the 22nd Marine Expeditionary Unit in southern Afghanistan in 2004 and Austin was his commander.